Debates on the much-disputed moniker of the Anthropocene often focus on the implied “we” of the term. That humans have remade the planet in their image is not in doubt, but naming this geological age after anthropos in general obscures the very different individual and national levels of carbon output, resource extraction, and exploitation of some humans by other humans. Some have argued that the “we” claimed by the Anthropocene covers over a number of antagonisms and dominances and serves to diffuse political dissensus and differential responsibilities. But there’s another problem of the implied Anthropocene we: there’s precious little example of all humans on the planet finding a way to speak and act as a collective for the greater good. The Anthropocene seems to mock us for not being an us. The title pins the “we” on its own inability to work together, to have collective goals, to universalize anything. 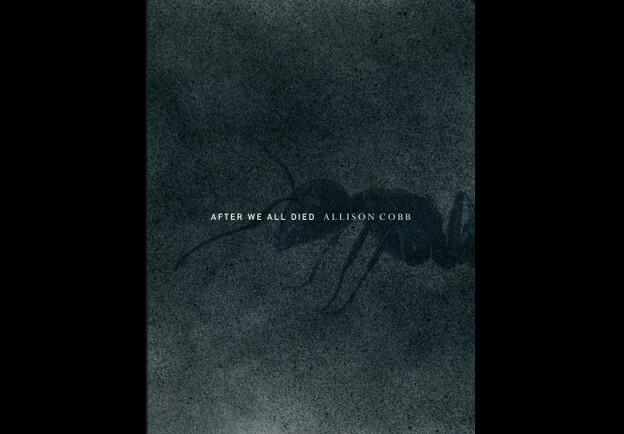 An exquisitely powerful new book takes up the we in its arms: Allison Cobb’s After We All Died (Ahsahta Press, 2016). I should say from the outset that this book does not just speak in and to the third person — many of the poems are written through Cobb’s first-person negotiation of a number of personal turmoils. Cobb lays bare her own archly situated viewpoint: “I filter the world through my own white, female, queer, worker drone, non-reproductive being” (51). This filter is also the semipermeable, aching, transcorporeal body featured in the book’s first poem titled “I Forgive You.” This poem takes up the early modern blazon of the female body, later restyled by Whitman’s list poeming his own body, by anatomizing Cobb’s stricken body while offering an absolution for her self-suffering. “I forgive you fingers. I forgive you wrists and palms. I forgive you web of veins, the nameless knuckles. … I forgive you every hair bulb, constantly dividing, pressing hardened protein shafts up toward the light. I forgive you cells, all one hundred trillion, the inner ocean that has ebbed and flowed across three million years. I forgive you every part performing all the intricate and simple tasks that make this mass alive. I forgive you all for already having died” (1–2). The personal sickness is the political. It is the ground for a feminist politics that wraps care and resistance together. In a way, all the poems in Cobb’s book are elegies. The book grants us a “we,” but only on the condition of its arriving after the invocation of its own finitude. The “we” evoked is already partly consumed and partly in the ground. “Let us go / blind and deaf / in dirt, so we can feel / for the worms / pressing up / with their infinite guts” (18-19). To be sure, the elegy is a remarkably variable and hybrid form — it can bury or raise the dead, cultivate melancholy or smash it. Elegy puts to rest and puts to unrest. Grief, like with Antigone, can shake the foundations of the state, but loss can also be nationalized and militarized. Once it was that elegy did the work of recuperating the dead body back into nature, signaling the cyclical returns of seasons and the ongoing life/death patterns of everything that breathes. Elegy has lingered around all sorts of loss and admissions of mutability and failure, including the recognition that language itself is structured upon its own loss of referentiality and loss of address. Elegy attaches itself to lost objects as an act of love, but it becomes “pathological,” according to Freud, if one cannot get some distance to the lost love object. Too much mourning, too much being with death, incapacitates the self, but you don’t get a self at all unless you can incorporate the losses and detachments that have gone into composing yourself. As Margaret Ronda discusses in a sharp essay, the elegy has become a more common frame for confronting ecological loss, including the loss of an older concept of nature. There is a long history of wrapping the elegy in the pastoral that is embedded in another elegy and again planted in another pastoral. But the elegy is being changed at its core now that we no longer can assume that nature offers a consolation and continuation after loss. The Earth itself is accumulating losses, from species extinction to destroying of indigenous and native ways of living to the acidification and desertification of the seas to the “weirding” of weather and the melting of ice caps and glaciers. So we now have elegy without the promise of recuperation, without the belief in an ongoing nature there to receive our decaying corpse. As I’ve discussed with other devices and forms in previous posts on post-ecopoetics, the elegy is broken, but still with us, still partly working but showing its wear and tear, laying bare its devices as it beckons all of us. There are a lot of intense farewells, I forgives, I made this, I remembers, I’m sorries, I know what you dids, I loves in Cobb’s poems. This is the elegiac terrain of address to the we after such loss. A negotiation with finding some sort of half-functioning elegy to fit the moment appears in the poem “For Love,” sent to and away from Cobb’s father who worked on nuclear bomb technology at Los Alamos. Right now, one of the few ways we can speak as a collective on a planetary scale is through our grief and our shared mortality. It isn’t much — it’s left melancholy, but because it gets expressed at a planetary scale, it also has something formally utopian in it because it is shared and not trying to sell anything to anyone. In the face of right-wing all trolling all the time from people who seem to want little more than to live in a world of insult, a rawer, fiercer communal elegy based on “refusing all the terms of this death into which we were birthed” steps up to become part of the fight.